For the past couple of years, I've been hosting Ugly Sweater Parties at my house...and I love them. I love the "tacky" sweaters and the Holiday spirit that comes with them. I'm definitely not the only one since tons of stores are now selling many options...from traditional sweaters, to cute ones, and funny ones (well, and definitely some offensive ones, but let's not get into that!). 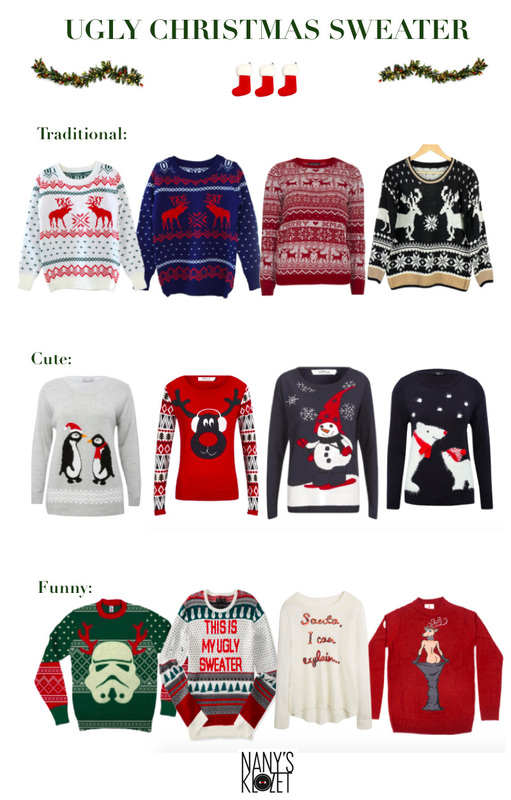 Also below are some easy ideas on how to make these sweaters a little more fashionable...but still fun and Holiday appropriate. Which one is your favorite? Which one would you wear? Desde hace un par de años, he estado haciendo fiestas en mi casa de Navidad con suéteres navideños....a mi me encantan, son "tacky" pero nos ponen en espíritu navideño. Y definitivamente no soy la única ya que muchas tiendas han empezado a vender muchas opciones de estos suéteres...y hay para todos los gustos. Hay unos clásicos, otros más cute, y unos con chistes (también he visto algunos un poco inapropiados...pero eso ya es otro cuento). También les dejo un par de looks abajo sobre como pueden usar esos suéteres de maneras que se vean chic pero también navideñas. ¿Qué modelo usarían? ¡BESOS! Pd: Aquí puedes ver dos ocasiones donde he usado este tipo de suéteres navideños. My family and I are having a themed Christmas party and doing ugly christmas sweater, thank you for some great ideas! I love the red skirt with the sweater, it'll be so cute!